Christmas is a time of family and holiday cheer. Fighting the shopping crowds to get that perfect gift, slaving all night over a hot stove to feed your family and putting up those decorations to capture that Christmas magic all comes to fruition on Christmas morning. The bright eyes of your children opening their gifts, bring the warmth to your heart which is the only reward you need. All the family bickering during the holidays proves worth it. Unfortunately that’s not the case for one family this holiday season. The lack of Christmas spirit and a son’s letter to Santa summon more than the jolly old Saint Nicholas down their chimney this Christmas. Krampus has come to punish those on his naughty list. There will be no Yuletide celebration, holiday spirit or fun family gathering this year. There are no happy endings when Krampus arrives. Trick ‘r Treat director Michael Dougherty follows up his acclaimed debut feature film anthology by taking on another holiday of horrors. A wonderful cast comprises our holiday family making the perfect setting for a Christmas horror movie. Dougherty recreates the comical Christmas Vacation family dynamic complete with a more realistic cousin Eddie in Howard (David Koechner) and borrowing Aunt Edna from the original Vacation in Aunt Dorothy (Conchata Ferrell). Then all hell breaks loose when the youngest son Max (Emjay Anthony) writes a letter to Santa. A dark, family holiday horror film, Dougherty may have shot for an audience too wide to become a horror classic like his first feature. Krampus does capture the Christmas tone and family feel but the comedy levels are high with a dark Krampus undertone which unfortunately conflict in such mirroring extremes. An excellent cast including a group of talented child actors accompanied by Allison Tolman, Toni Collette and Adam Scott hold together some form of believability in their characters while Christmas horror vomit hits the screen around them. Krampus is still a lot of fun with memorable scenes of killer cookies and a jack in the box of horrors. 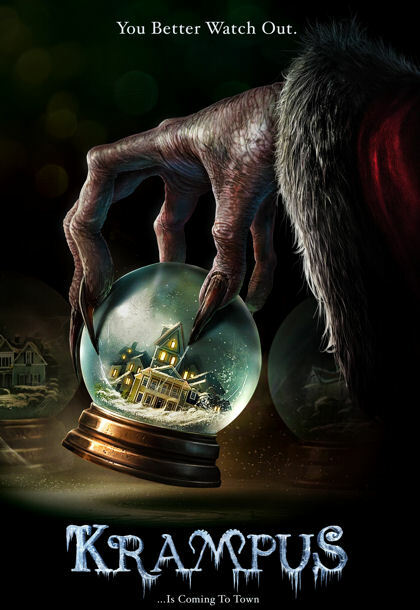 While it may not make my yearly Christmas watch list, it may occasionally sneak into the rotation as the best Krampus movie I’ve seen so far.